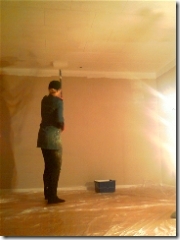 The weekend was spent on washing the inner walls and ceiling and then painting the ceiling. When you're not used to looking up all day long with your hands in the air, it's quite hard work. My parents and my sister, her boyfriend and my gorgeous little newphew came by with some flowers for the garden. Thank you for you help. It's good to get started and we believe it's gonna be a great little house one day.